There is a popular saying that claims that the squeaking wheel gets the grease. The role of the Drill Sergeant is a huge squeaking wheel in CEDRIC philosophy, and it’s true that since this is the part of the problem that is the most vocal and apparent, it is what garners all the attention. I have come to view the role of the Drill Sergeant as the canary in the coal mine, in that if I have an inner voice that belabours and berates me, it is a sign that all is not right, and that there is a inadequacy of my self-esteem, which should be balanced enough to keep the negative internalizing at bay. 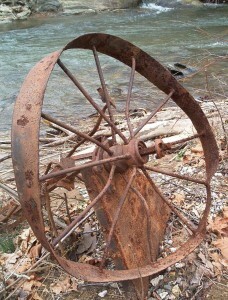 If most are like me, they’ve misunderstood and compounded the harm of this enormous squeak of this wheel by giving it credence for years, without really recognizing its value. Years of trying not to hear the harsh, hateful criticisms that blindsided me made me exceptionally good at one thing. Denial. I could block it out like I blocked out the immature noises my son made as a child, but was I doing myself any favours in this solution? In hindsight, I see that the answer to that is ‘hardly’. In Gavin de Becker’s book ‘The Gift of Fear‘, he speaks of how our responses to threats are hardwired in us to protect us. He gives an example by showing how we listen to the protective instincts within ourselves when we get behind the wheel of an automobile. We look around us and subconsciously take in signals from others that indicate to us wether the car beside us is going to switch lanes or the vehicle ahead of us is about to turn right or left, but Becker says, the minute we get out of that car and shut the doors behind us, we turn off that instinctive personal radar and cease to listen to its warnings. This phenomena of recognizing our protective reflexes in one situation yet negating them in others is very interesting to me. When I’m driving, I don’t hear the Drill Sergeant at all. I simply do what I have to do with him kept busy keeping the car where it should be, I guess. Maybe that’s why I enjoyed driving so much, it gave me a break from the relentless diatribe. In Michelle Morand’s book, ‘Food is not the problem – Deal with what is‘, Michelle says that the Drill Sergeant likely uses the same tone of language and respect or disrespect as we experienced when we received when we were traumatized or forced to endure a difficult life passage. In my case, I know this explains why my DS sounds so much like my mother, with her clipped British tones to the never-ending German accent. She was very angry at her own life and would direct that rage at me whenever she decided I had let her down again. Now, I see that I am a textbook case for Michelle’s message and in a way, I’m lucky to have found someone who can help me to internalize a new kind of self understanding in order to move on. In a way, I feel like I’m being untangled, unscrambled, like the funhouse mirror is becoming less wonky and I can now trust my internal perceptions without the doubt that was generated by such a diminishing canary. I think that recognizing the DS for what it is, is the first step in the healing… and I’m so glad that I’m there and moving beyond. As I read about another internalized contributor to my evolution, I see that it takes getting to a place of making peace with the DS, that allows us to move it to a back burner where it is much quieter after shifting the DS frustrations away from our inequities Back there, the DS is where it can do what it was intended, which is to protect us…and subsequently I can now allow the Nurturing Parent to take the stage more, getting ever closer to my Authentic Self. I’m lucky that I have good friends who role model the nurturer in my life so that at least I have an inkling of what it is to be nurtured. When visiting or spending time with these good friends, I am met with hugs, love, concern and the immediate cup of tea that soothes my wrankled edges and helps my frayed self to come together again in a grounding way. Now that I have the DS in a headlock, (just kidding) I meant to say, under control, (somewhat) I can finally have space in me to give myself the pampering and respect I deserve and desire. The internal Nurturing Parent is now able to redeem my self worth quickly in situations where I feel like I’ve been diminished. It allows me the freedom to make up my own mind about decisions that need a clear head. At the very least, in those crucible cases when I feel forced to make decisions faster than is recommended, the NP is there to remind me that its not impossible to step back for a bit, in order to ponder the situation rather than leaping blindly into the fray as the DS used to taunt me to do. The key here is on page 53 as I slowly work my way through FINTP. Michelle’s wise words that follow are in bold and for good reason. This should be a mantra for this part of the developing new psyche we are healing within. So, keeping that in mind, use me as your inspiration if you must, but like Michelle says, ‘Don’t let the DS have the last word’ No matter what its intentions are, whether for good or otherwise, make sure that its your Nurturing Parent that wraps up your conclusions about matters that previously would have been tarnished with the belittlement the DS is so good at. Give yourself credit for the small accomplishments. I used to nurture myself with food, now I use things that don’t have a caloric count as rewards for affirmative changes in my process, nor do I poison myself with highly processed diet foods that espouse ‘no caloric content’, because I don’t use food as a reward at all. Instead of a knee jerk response (as in ‘running to the shelter of my little mother’s helper’ from the Beatles song) I am now capable of asking myself what I would rather be doing, and then reward myself with something related to that. I reward with conscious intention now. Be it a walk to the ocean, an hour of making jewelry, or calling a friend for a heart to heart, I have other options now that I’m more aware of what’s going on inside me. Nor do I use foods to dumb myself down, to distract myself from my frustrations or to placate what other needs unfulfilled can’t do. It’s a small thing, but it’s huge to me, as I can now have the freedom to feel loved in all my efforts, not just a select few. That sort of support is priceless at it grounds, heals and ultimately, allows me to move into my future with surer footsteps. The journey continues, but thanks to the process I’m garnering from my lessons, reading CEDRIC’s book, handbooks and the CD’s, I’m in a much better equipped place to heal and to move into a life that is not tainted by distorted self evaluation. Having the facts really helps. Trusting myself to have the facts is paramount to my having a spine, to my sticking to my guns and to my knowing when to give up and walk away from things that no longer suit me. All I can keep on saying is ‘thanks Michelle!’. Like water to the person crawling across the desert, I needed this guidance as I have been in a drought of my own, a personal, internal drought that is OVAH! I can’t help but blossom and thrive now. The wheels are no longer squeaking either. Ahhh… serenity. Won’t you join me?